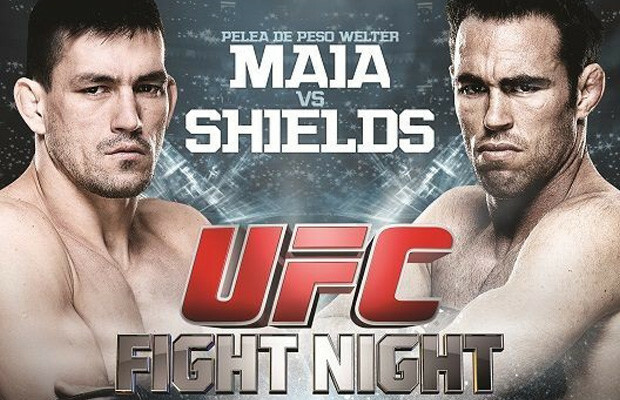 On October 9th, 2013 the UFC Fight Night 29 comes to FOX Sports 1 with a great free card headlined by a welterweight bout with title implications between Demian Maia and Jake Shields. Both men have contended for the UFC title with Shields at welterweight and Maia a tmiddleweight Both did so unsuccessfully. That’s not where the comparisons endthough. Both men are fantastic black belts in Brazilian jiu-jitsu and have demonstrated such in their MMA careers. So ready or not, here comes the breakdown for this battle between these top contenders. Neither of these men have been known in the past for their striking skills, but one man has come leaps and bounds from being known as just a grappler. Demian Maia’s striking has been developed expertly and has looked extremely crisp in his last few fights. Jake Shields isn’t bad by any means on the feat, but he is not very offensive. Shields’ hasn’t put any of his recent opponents in danger on the feet, but he has nullified their striking. Take a look at the Tyrone Woodley fight, though not exciting; Jake Shields managed to keep one of the most powerful strikers at bay for three rounds. Verdict: Maia has the striking edge. Both men are accomplished submission practitioners, but this category is more about overall grappling ability. Demian Maia in the past has been known for having a hard time getting the fight to the ground, for example his match with Anderson Silva for the UFC Middleweight Championship. In more recent times Maia has shown improved wrestling, taking down more experience wrestlers like Jon Fitch. Jake Shields like Demian Maia is a great submission specialist, but he’s also a two time Division II All-American Wrestler. Shields has out wrestled the likes of Dan Henderson, Jason Miller, Yushin Okami, and Carlos Condit to name a few. Verdict: Shields has a slight grappling edge due to his long wrestling history. Demian Maia as I have said is a fourth degree Brazilian Jiu-Jitsu Black Belt with nine submission wins and four submission of the night awards. In Brazilian Jiu-Jitsu Demian Maia has a gold medal and silver medal from the Abu Dhabi Combat Club as well as multiple championships. Jake Shields may not be as experienced in the Brazilian Jiu-Jitsu world, but he has 10 submission wins in his MMA career as well as a bronze medal from the Abu Dhabi Combat Club with a win over Jiu-Jitsu ace Leo Santos. Verdict: Maia has the advantage in the submission department. Demian Maia has looked unstoppable since his drop to the Welterweight division. He has been a lean mean killing machine, with two of his three wins coming by way of a finish. On top of this he looked fantastic in his unanimous decision win over Jon Fitch. Jake Shields has been struggling to gain momentum, even though he hasn’t been defeated in his last three fights. Shields has been known as a smothering grinder, but the real question is if he will take that chance against a submission ace like Maia. This could be a very interesting fight depending mostly on how Shields decides to fight. If Shields tries to come out and take Maia to the mat and grind him out, it could be a very short night for Shields. The only chance for Shields is to come out and put on a Randy Couture style fight. In my expert opinion, Maia has too many tools to finish the fight but I’m thinking that Maia will win by a third round TKO.